Locate Hwy. 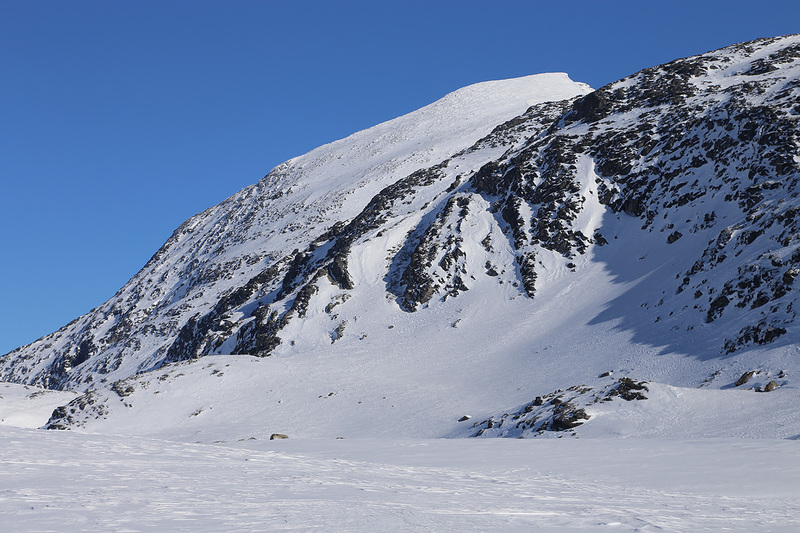 15, connecting Otta and Lom with Stryn. Near the highest point on this mountain crossing, the old road (only open in Summer) forks off at a small place (basically a hotel) called Grotli. Continue 4 kilometer from Grotli direction Stryn, along the new road, then locate a small parking area on your right (if coming from Grotli) at location N62.02999, E007.56051, elevation about 905 meter. Park here. If coming from Stryn, this is left immediately after the road makes a right curve, crossing a small part of the lake. From the trailhead, follow the old road (buried) as it curves left below steeper terrain. As soon as you can follow the main vally uphill, do this staying on the right side of the creek. Note that the creek forks, continue uphill staying well right of the right fork called Skomakerelvi. Continue uphill, direction NE towards the small lake 1143. Turn more left here and continue a bit west of north up a very smooth and gentle uphill in order to reach the south end of Fremste Vikvatnet. Turn north-east and ski to Skrådalsvatnet, 1320m. 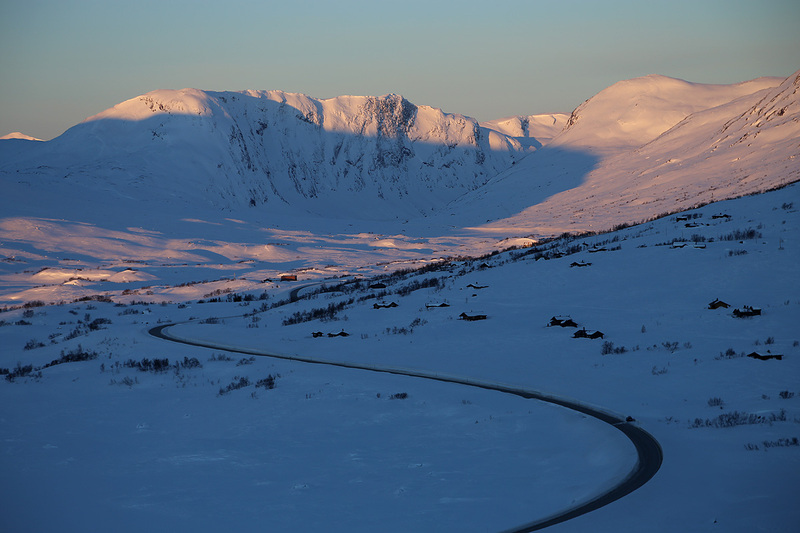 Continue through Skrådalen, then descend to the upper part of Vuludalen. You loose about 140 meter of elevation here, but any attempt to contour left gets you into avalanche terrain. 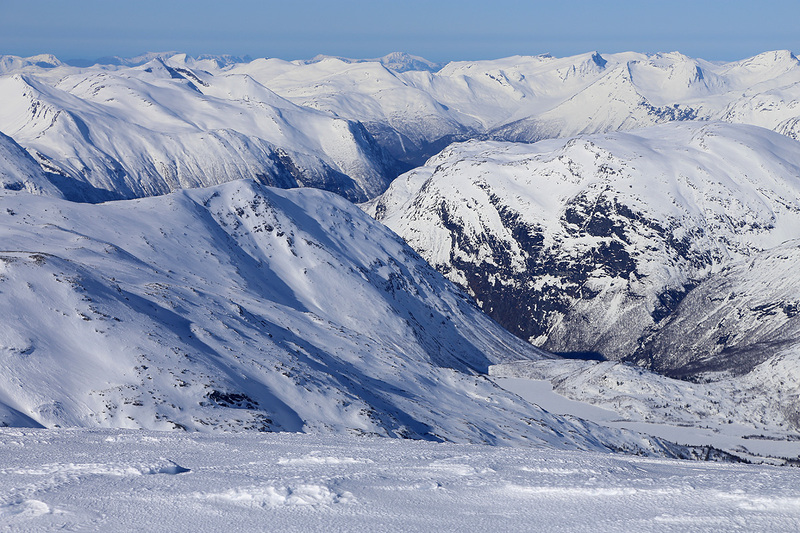 Ski up the last part of this valley to Grønvatnet. Finally, you now see the summit up front (to the right). 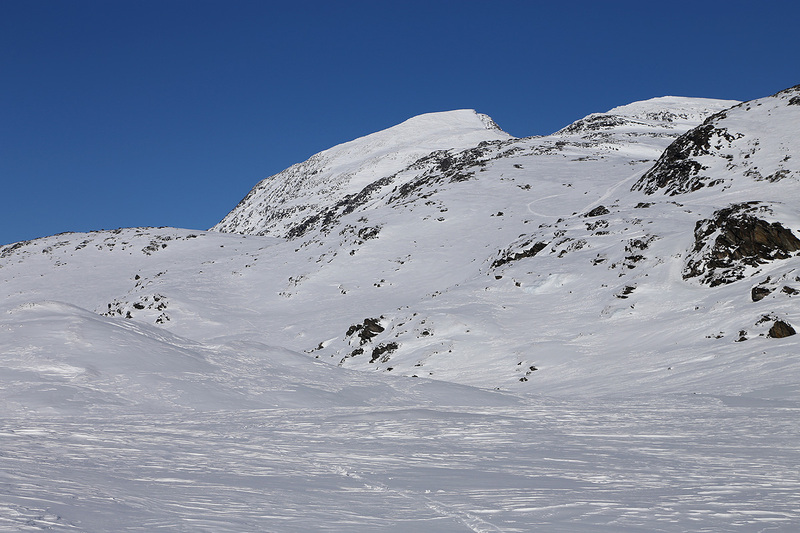 From here, the summer trail climbs right, it is better to ski a bit north on the lake, then climb slightly right, following a very natural ramp with an easy slope, that will connect to the very upper part of the creek that drains lake Simlevatnet, 1418m. Cross the south end of this lake and ski up the slope that runs north from the west end of lake Styggedalsvatnet. Contine uphill, staying left (west) of the highest terrain. You will find easy, gentle slopes here as you get higher. Continue below more rocky terrain and ski close to the west side of the small summit that sits on the ridge before Tordsnose. You can traverse just below it and access a nice passage that turns right and gets you to the col south of Tordsnose. Ski along the ridge, beware of some cornices that face east. The last 150 meter vertical is not as steep as it appears. If the snow is good, then just zig-zag up to the summit. 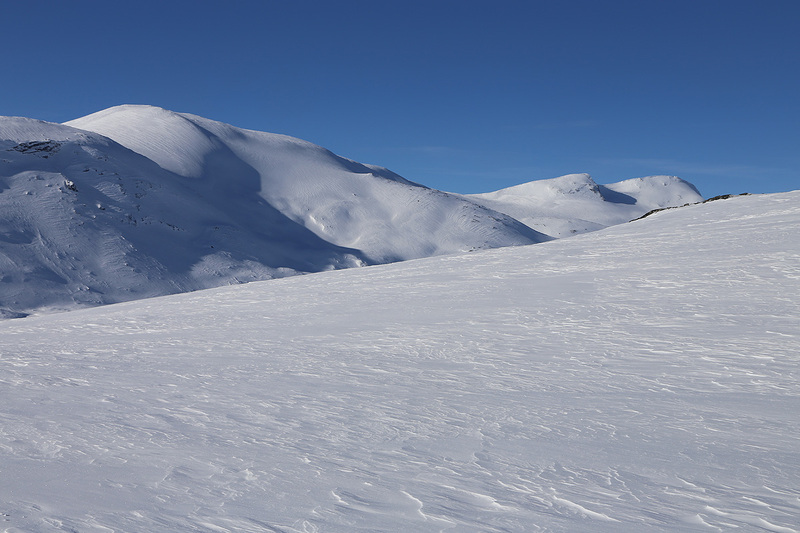 If the slope is icy, leave your skis and proceed on foot. 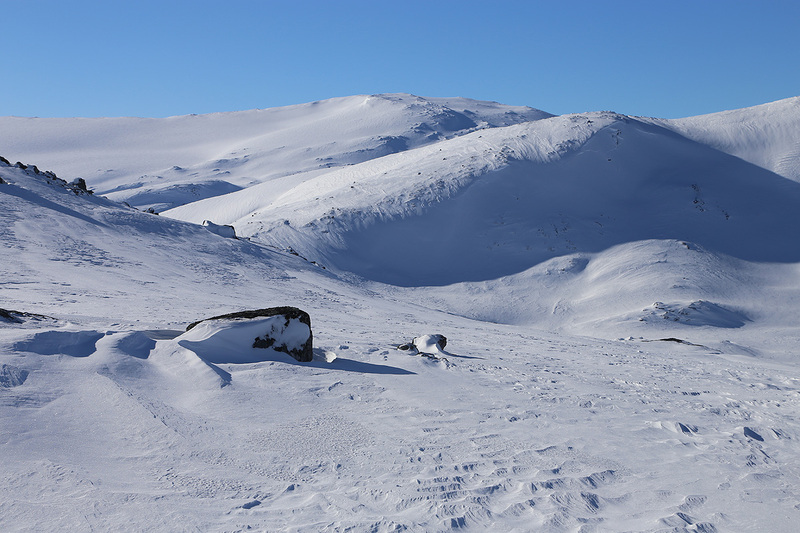 It may be smart to carry crampons and an ice-axe, just in case the conditions are very icy. I guess this is rather unlikely, but just in case.. The weather forecast was just super for this weekend. I therefore decided to drive all the way to Grotli and attempt two of the really high major summits that may be climbed on skis. I left Bergen at 1530, got stuck in a Friday afternoon traffic-jam, but still made good time, arriving at the trailhead before 2200. Saturday morning, the temperature read -18.5 C, good to have a proper sleeping-bag! I started skiing at 0700. Not a single track, but a beautiful morning. The sun was already painting pink colors on the peaks. I made good progress and got into some headwind at Skråvatnet. I tried to countour left to avoid some of the descent, however, this got me into steepish terrain with bad (avalanche) snow. I quickly descended along a pretty safe route to the valley floor. 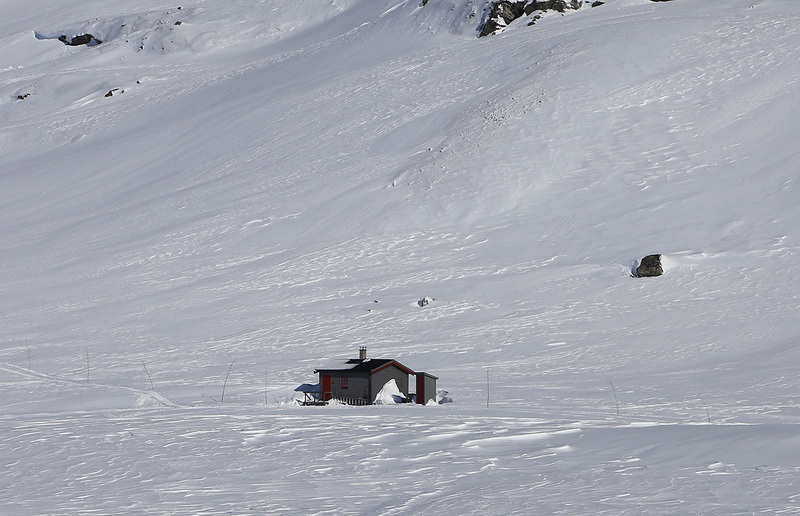 The route up to Grønvatnet was easy, there is a small hut on the right hand side here. The natural slope up ahead provided a very nice route to the higher lake Simlevatnet. Skiing continued to be good and I was soon at the final ridge leading to the summit. The snow here was surprisingly icy in patches and skiing was not easy any longer. I left my skis around elevation 1810. I was not very happy about having left my ice axe and crampons back home. With it, one could walk directly to the summit. As things were, I needed to find good snow for my boots, thus a slightly convoluted path, but I got up without any trouble. Arriving at 1210, the climb had taken 5:10. Very nice view all around and almost no wind. 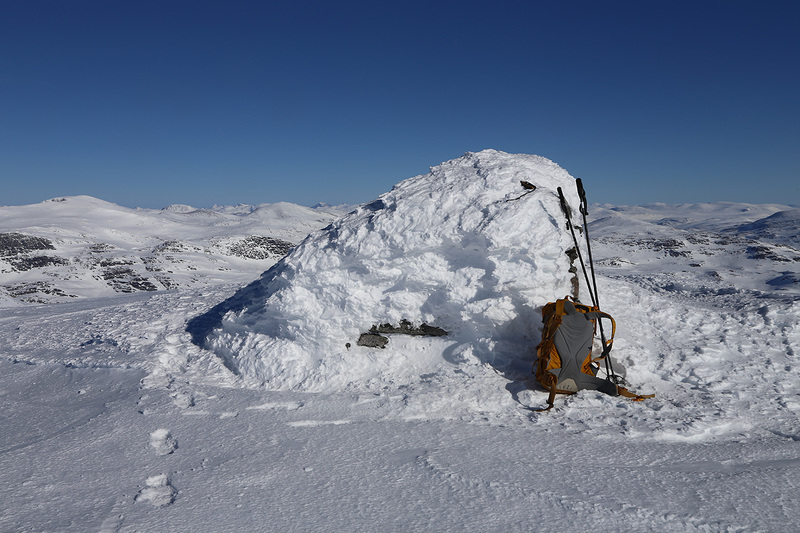 I took a full panorama set of photos, the a piece of Kvikk lunch (Norwegian chocolate). Leaving at 1230, I started my return in this extremely nice weather. The return ski was uneventful as I returned to the car at 1540. Hurrungene. note the Ringstind - Austabotntind pair. Summit Panorama I. North (Tafjord). Summit Panorama II. Continued north. Summit Panorama III. North-east towards east. Summit Panorama V. South, Hurrungane.